I’m participating in a barter market later this summer. People are bringing all kind of different things to trade; home brews, crafts, baked good, etc, and I wanted to come up with something a bit different to bring outside of printed artwork. I don’t have a lot of “craftiness” in me outside of drawing and painting, and with my crazy-busy schedule creating a bunch of original drawings to trade just didn’t seem feasible. I racked my brain for a couple of weeks trying to come up with something unique to bring, and I finally landed on the idea of hand decorated ceramic tiles. I was pleasantly surprised by how cheap tiles actually are. Obviously I have never been in charge of remodeling a room before or I might have known this, but I went to my local Home Depot and discovered that plain white ceramic tiles were only twenty-five cents each, and large tiles were about sixty cents. I’m sure that if you’ve covering the entire surface of a floor or wall the price adds up pretty quickly, but I walked out with a nice stack for less than twelve dollars. I was pleased that I’d be able to make something awesome with a relatively small investment. 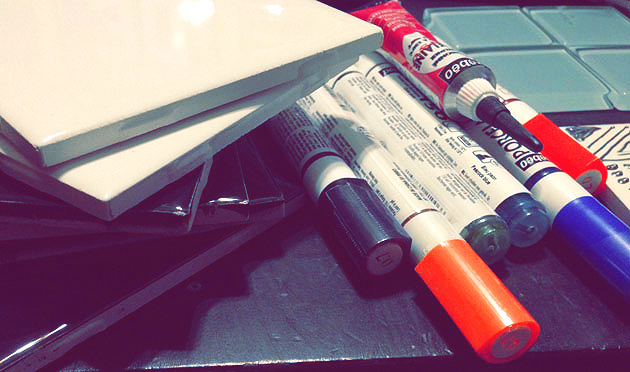 With the tiles carefully stacked in my trunk, my next stop was Blick to figure out what paint to use. I didn’t think acrylic paint would work very well. They had almost too many options; porcelain paint in tiny jars, two different sizes of porcelain markers, and porcelain paint in tiny squeeze tubes. I settled on Pebeo Porcelaine 150 Paint Markers markers, since I wanted to decorate the tiles with tiny intricate details. 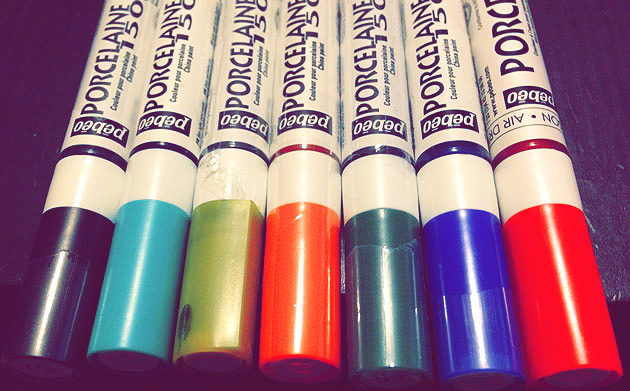 The paints/markers were not cheap – almost six dollars each. With visions of beautiful colorful hand decorated tiles in my head, I grabbed one in each color. The first marker I used was dead. Totally dead. I shook it for about thirty seconds like the label suggested, and repeatedly pressed down on the tip to get the ink flowing. No matter what, no ink would come out. After testing the marked on a spare tile, a blank piece of paper and a piece of cardboard, I gave up. Sometimes when you buy markers you get a dud. I get that. I noticed that when I shook the second marker I got a rattling sound, like when you shake a can of spray paint. The first marker hadn’t done that – even more reason to think I got a bad one. 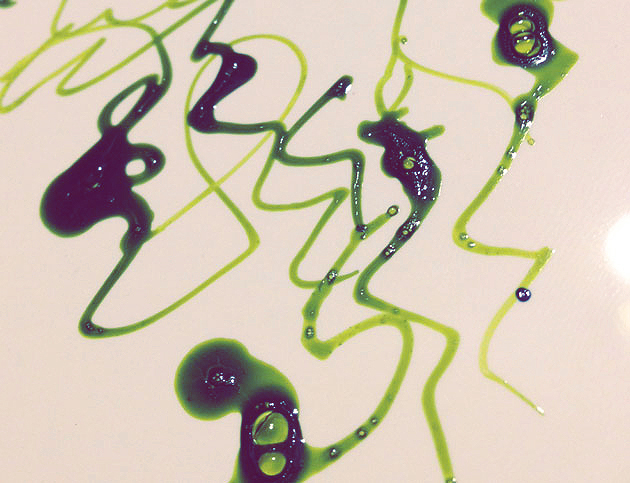 Shake, press down….and we have INK! It actually flowed really beautifully on the tile. Nice thin, clean, crisp line….for about a minute. Then the ink stopped flowing. I put the cap back on and shook it again, wiped off the nib on a paper towel, and tried again. A couple more lines, and it gunked up again. Shake, clean, gunk, shake, no line, shake, repeat. Frustrating. Third marker. Same deal. Worked like a dream for a minute, then all ink flow stopped. No amount of shaking or pressing on the nib would restore it to that nice line I got the first time. In fact, with a lot of the markers I’d get a giant pool of ink gushing out after a couple gentle presses of the market to the file. So either no paint flow, or giant puddles of pain. Not the look I was going for. You can see the blobbiness I experienced on my test tile below. Another problem that I had is that the colors could not be layered. Once the paint began to dry at all, if I had to go over a line a second time to clean it up. the marker would rub the paint away. If you can picture what happens when you’re writing over something on a dry erase board, it was exactly like that. The squeeze bottles worked much better. In fact, I had no problems with them, other than that they weren’t really suited to my project. That however, is not the products fault. I was able to apply nice even, think lines with the tubes. The only problem I noticed was that it was difficult to make curved lines, and at the start and stop of every line I got a little blob of paint (think back to using puff paints as a kid) For decorating large areas without a lot of details they probably would have worked great. Merchant response: We believe the pens you received are defective and would like you to know that you are entitled to a return/exchange or full refund within 30 days of purchase. Please contact our Customer Service team at 1-800-723-2787 for assistance. We apologize for any inconvenience this caused you. It sounds like I wasn’t the first person to have this problem. I called the customer service line, which turned out to be only for online orders, and they provided me the number to my local store. I called the Blick where I purchased them and they said that I could do a refund or exchange, so I definitely feel better knowing that I’m not completely out all that money I’m still a little bummed that the really cool project I was so excited about didn’t quite pan out. In retrospect, I wish I’d purchased the little pots of paint and used a brush to apply the designs instead. I really would like to give the markers another shot, because when they did worked they worked great, and there were enough glowing reviews about how great projects look after you bake them to set the design that it makes me want to try again.